Thomas R. Waldron graduated from Clemson University in January of 1962 with a degree in civil engineering. He also had completed Air Force ROTC, and upon graduating was commissioned a USAF 2nd Lieutenant. Then came flight training at Vance AFB in Oklahoma. After more USAF training, including survival school, Waldron’s first duty assignment was as a KC-135 Stratotanker co-pilot with the Strategic Air Command flying out of Columbus, Ohio. 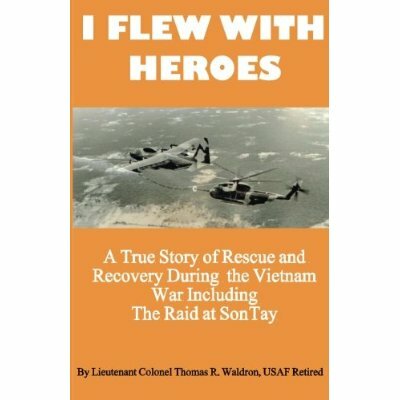 In his memoir, I Flew with Heroes: A True Story of Rescue and Recovery During the Vietnam War, Including the Raid at Son Tay (CreateSpace, 172 pp., $14, paper), Waldron concentrates on describing his 1969-70 Vietnam War tour of duty in which he flew K-135s, and then HH-3 and HH-53 Jolly Green rescue helicopters in Vietnam, Thailand, and Laos out of Udorn Air Force Base in Thailand. He and the three other Apple 3 crewman received the Silver Star for their actions during the raid. Even though there were no U.S. prisoners at the camp, the assault force killed scores of North Vietnamese troops and returned without losing a man. The author is donating a portion of the profits of book sales to the Wounded Warriors Project.